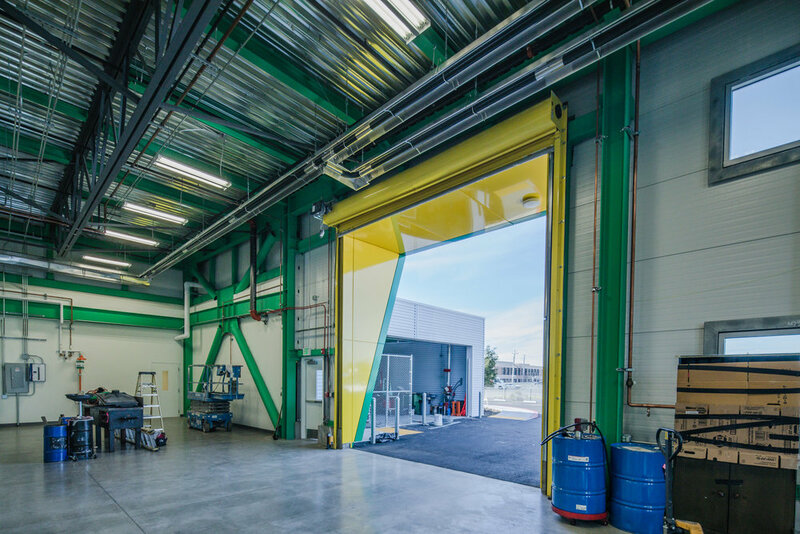 The Sonoma County Fleet and Materials Lab Building is a facility that provides maintenance and repair services for the county’s vehicle fleet and includes a laboratory for testing of construction materials used in road and building construction. The facility is 21,000 SF and located prominently on the corner of the Redwood Highway (Hwy 101 North) and Bicentennial Way in Santa Rosa. The building’s two main components, the vehicle service area and the combined office/lab area, are expressed in the architecture as volumes with different height and different cladding. The office/lab building includes a welcoming green canopy covering the entrances and shading the south-facing windows. This design element is repeated above the roll-up doors in the service building to provide weather protection. The roof is fully reflective (high albedo) and designed to receive solar panel arrays in the near future.